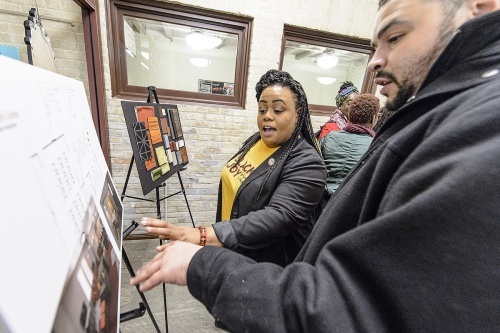 For several months, Marquise Mays avoided even glancing at the construction of the new Black Cultural Center inside the Red Gym on the UW–Madison campus. Mays, a junior from Milwaukee and president of the Wisconsin Black Student Union, said he wanted his first look to be special, free of any preconceptions. He also wanted to experience the moment alongside the many classmates, faculty, staff and alumni who had long sought the center and had worked to see it come to fruition. That moment arrived Tuesday with a dedication of the 2,300-square-foot space attended by about 150 people. 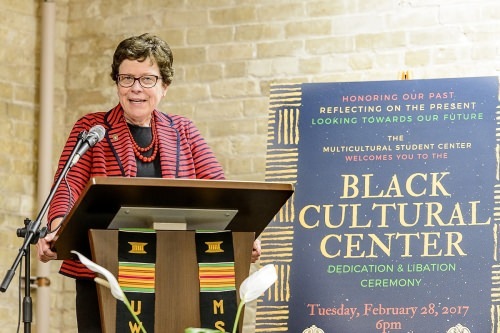 “This center will be a place for people – not just black people, but the whole UW community – to learn about the vast contributions of black students to this university,” Mays said. 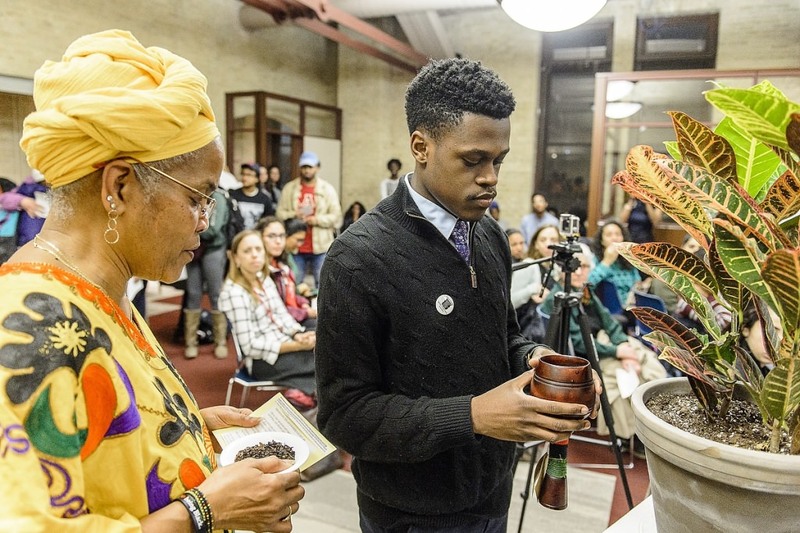 The event coincided with the final day of Black History Month and included a libation ceremony, a ritual pouring of water to honor those who have come before. Members of the University Gospel Choir performed. 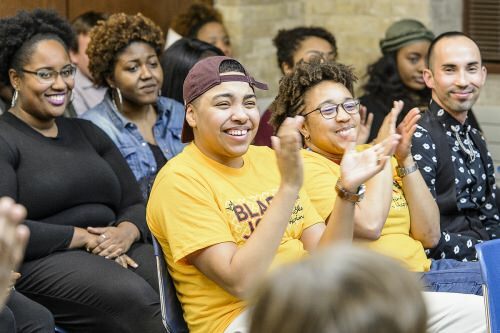 “It is difficult to imagine a more fitting way to close African-American History Month than by opening a space – even if it’s not quite open – that will invite us to reflect, all year round, on the rich array of contributions of African-Americans to this campus over its history,” said Chancellor Rebecca Blank, who welcomed the crowd. Renovations of the space are about 70 percent complete and the center is expected to become usable in a few weeks. A grand opening is anticipated in early May. Chancellor Blank gave examples of people the center will honor, such as William Noland, the first African-American man to graduate from UW–Madison (1875); Mabel Watson Raimey, the first female African-American graduate (1918); and Dr. Cornelius Golightly, the university’s first African-American faculty member (1949). The Black Cultural Center (BCC) is located on the first floor of the Red Gym, 716 Langdon St., in space that most recently housed the International Academic Programs’ Study Abroad Resource Center, now on the third floor. Patrick Sims, vice provost for diversity and climate, told the crowd the center will serve as a formal venue for programming, community organizing and academic activities related to black culture and other culturally appropriate uses. The center will include a lounge, collaborative work areas, computer work stations and space to showcase art. It is adjacent to a new 25-seat classroom that can be reserved for use by the center and others in the building. 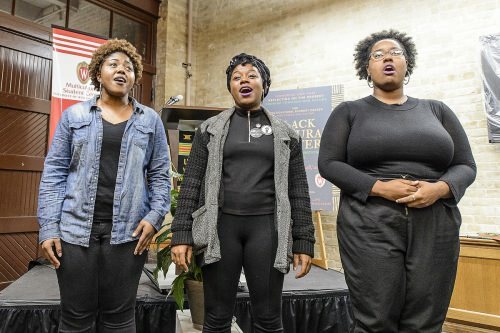 A visual timeline will honor the contributions of black students to the university. A full-time coordinator will be hired to run the center, with other positions filled by students, Javier said. Students have been involved in helping to shape the center and its programming, including serving on the center’s advisory board. Breanna Taylor, a junior from Milwaukee who serves on the Black History Month Planning Committee, said in an interview that the center is needed to showcase the “full scale of blackness on campus.” The center will reenergize black-identifying students, allowing them more control over how they are represented on campus, she said. The university opened an Afro-American and Race Relations Center in the late 1960s in response to demands by black students. The university closed the center in 1973, saying at the time that, due to a decision by the Board of Regents, campuses could fund only multicultural programs, not ones focused on specific races or ethnicities. The closing of the center led to more protests. The latest push from students for a new center heightened in 2015 and continued through last year following a series of bias-related incidents. Chancellor Blank agreed with the need for the center, making its creation one of several priority initiatives to improve campus climate.